2015, where did you go! I Remember being stood in a hill top after walking the grand union canal, then all of a sudden I’d ran from Paris to Dieppe, Scooted Liverpool-Leeds canal and slept out more nights than I could count! 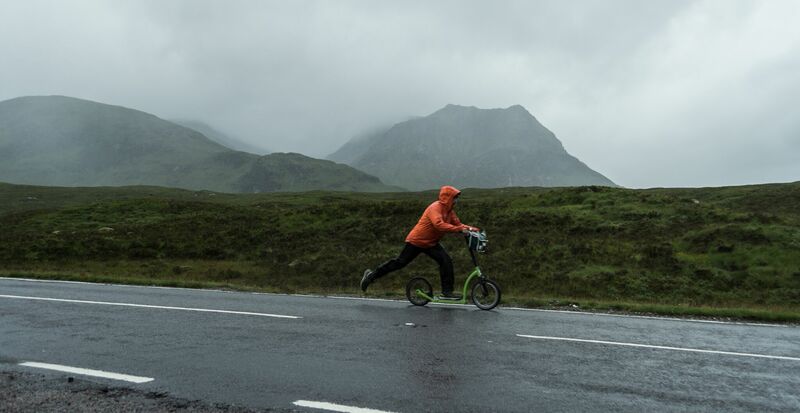 I’d quit work and become the first person to scoot LEJOG on a 16″ wheeled kick scooter, moved house twice and found my passion for supporting a children’s charity and desire for story telling to inspire others. I’ve been hit by challenges I thought would break me, but here I am a little scarred, with more knowledge standing just that bit taller. Its landed with a driving force, the echo’s and attitude that what ever we deem possible is truly accessible right there just in that place outside where comfort kills ambition. If you are going to try anything today, this week, this month or in 2016 it should being more adventurous with everything. Have the gaul to know that someone will get that job, win that free prize and be in the right place at the right time. So, why shouldn’t it be you? It won’t happen sat on the sofa, it’ll happen by being more you, getting out, watching the sun rise, doing something simply just because and not caring if no one else is walking that path, that’s even more reason to be a trail blazer. This all sounds epic! I did the Welsh 3000’s a couple of years back – the hardest physical challenge I have done to date. Perfect weather and a day I will never forget! I like the dedication to exploring your own surroundings. I myself have been from one end of Canada, top to bottom, left to right into every province and territory. (or vice-versa!) Not many people can give me the same claim in exploring their own place of birth. It’s a great feeling. I find these days I much prefer to travel abroad to see older cultures and historical stuff the infrastructure isn’t old enough here to provide. Aahhhh thanks man!! Yes I agree, let’s make 2016 an amazing year! Whats the best way to get in touch with you for work opps?